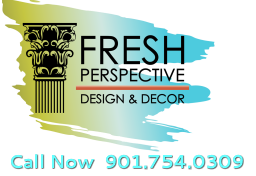 Fresh Perspective is a residential and commercial interior design firm that offers you an innovative and friendly approach to "traditional" interior design services. We offer our clients and local designers a "to the trade" design resource library to special order fabrics, furniture, art, wallpaper, accessories, lighting and more. Why settle for the showroom floor model when you can have a custom piece that perfectly defines your unique style and budget? From finding the perfect paint color, to reupholstering a sofa, to stylizing your entire home, Fresh Perspective has a service and product to fit all your specific design needs. Let Lynne & Valerie help assist you with your project today. ©2018 Fresh Perspective Design & Decor, LLC. All rights reserved. 776 East Brookhaven Circle, Memphis, TN 38117.